We have recently completed another Show Home on behalf of Stanborough Construction in Turks Lane, Poole. This is an exclusive development of 4 impressive, contemporary homes situated in a prestigious location facing Whitecliff Park. Each detached property consists of 4 bedrooms, garage, formal lounge and a spacious open plan kitchen, dining and living space. Rachel Stanborough, co-owner and Director of Stanborough Construction, has an excellent eye for design and detail. 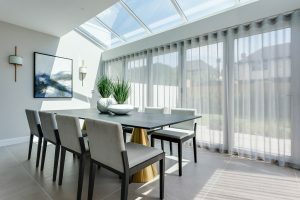 It is very important to Rachel that these show homes are presented to a very high standard which reflects the build quality and the entire construction process that has gone into these homes. 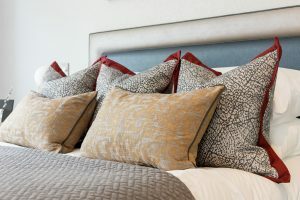 Marlaine, our in-house designer and Rachel have worked closely together to create luxurious and comfortable room schemes. 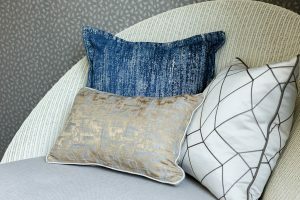 The colour palette of each room or space has been carefully chosen with all paints, wallcoverings and fabrics blending together to form an interior which is very pleasant to the eye. Luxurious, exclusive, textured wallcoverings instantly add a touch of luxury to the home. 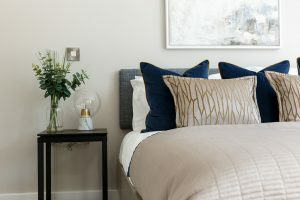 Their use of contemporary fabrics incorporating designer patterns, trend colours and textures add the finishing touches that this home deserves. The fine details and high quality finish makes this home modern and exclusive yet remains warm, comfortable and welcoming.